Originally posted at Mon 27-09-2010 23:19:22, in the fun category. Last Friday the 24th I've been to a racing track to drive on one myself for the very first time! 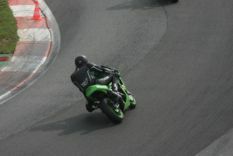 With Dirk and some friends from MF, I went to the track in Zolder, Belgium. For the occasion I had bought a second, cheap bike, one that was already customized for racing on tracks. This had various reasons. Firstly I felt pretty certain that I would be loving it and probably wanted to be doing it more than once. 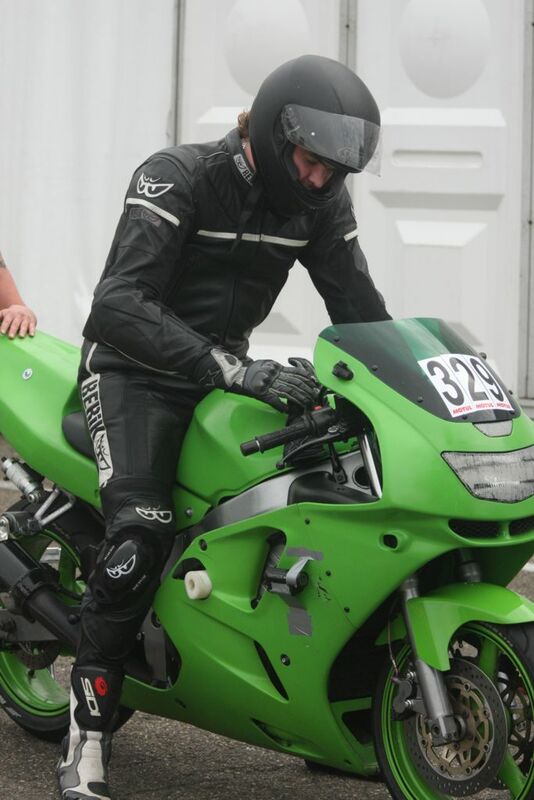 Secondly, I had phoned the insurance company for my (street legal) Ducati and had found out that they didn't cover racing on tracks, even it wasn't an official race, had no lap timing whatsoever, and top speeds weren't the main goal. Well, they would have covered all of the above.... but only if it was in The Netherlands. And I ofcourse had already booked and payed for Zolder before I found out about this. We left on Thursday, and made the trip to Beverlo in Belgium, where one of my friends had booked a B&B for one night. It's a small B&B very near to Zolder (only 15km away). Awesome place, very tidy, nice people, great breakfast, I can do nothing but recommend the place to you if you ever want to go there yourself! We went with six people: Anna and Dennis in one car, with my motorbike and theirs (a CBR600F2) on a trailer. I myself was in the second car with Annet and Dirk, with a trailer that contained Dirk's motorbike (a Suzuki RF900R). Dirk's sister went by herself, coming from a completely different place in The Netherlands. 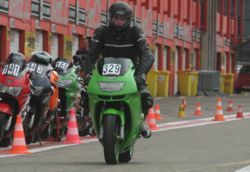 Since the ZX6R isn't street legal, I had no opportunity to drive it before I went to Zolder. Normally when I drive a new type of bike for the first time, the first few kilometers are very slow. 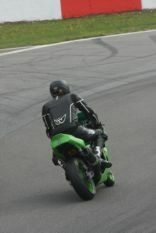 I try to obtain a feeling for the way the bike brakes, steers, and accelerates by taking it easy. But going to a racing track I knew beforehand that there wouldn't be opportunity for taking it slow. This caused considerable stress in me. 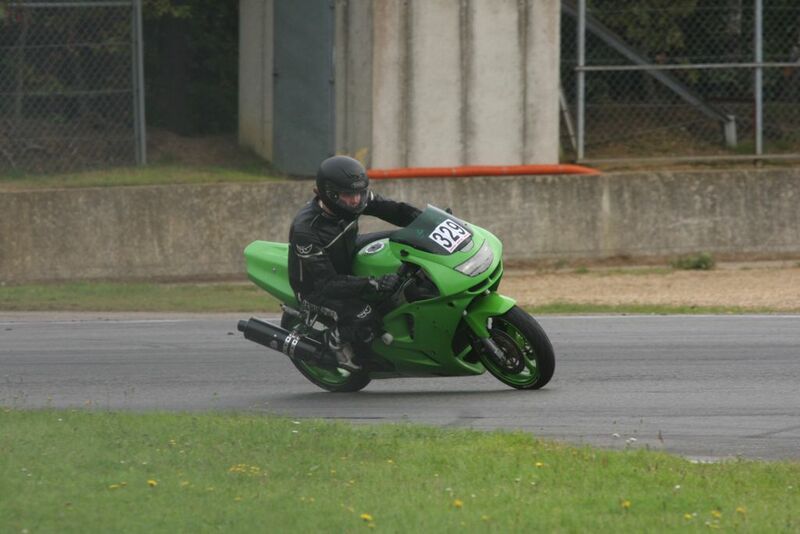 Even more so, because on top of this, the bike had new tyres (less grip, more chances to crash), the track was wet, and I had no idea what to expect about what was going to happen exactly! Suffice to say I was slightly stressed when I entered the theory room for the first time. This room is where about 60 of us gathered to get some basic information on racing on a track. Luckily, Iwan our Belgian instructor was a Fleming so I didn't need to try and understand any French: Flemish is just funny pronounced Dutch. Also, he kinda felt the stress that seemed to be haunting more people than just me about the wetness of the track ("hey, just remember, it's just water!"... right, very reassuring), as he said the first session would be very, very slow. So quite unexpectedly, I got the slow first few kilometers I had feared I had to miss out on. The first session, although slow and filled with stress, was a blast. The main racing line had dried up already because we were the fourth group to enter the track at 10:00. Faster groups had already been driving it for an hour or so, which was ideal for us racing noobs. All I needed to do was drive on dry tarmac to be safe. This had a very big advantage. Since in our slow group you constantly were following a marshall, and these guys were by habit driving the main racing line, I automatically learned where I was suppose to drive when the track would have dried completely (and the racing line wouldn't be obvious anymore!). For our group, there were a total of five sessions. 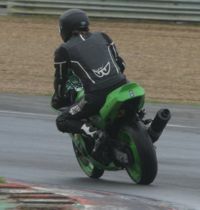 The first one was slow and slightly wet, but by the time we went out on the track for our second session, the track had almost entirely dried up! Although I've heard people say that a day on Zolder isn't organized as neatly as for example Zandvoort or Assen in The Netherlands, I myself have no complaints. After every session we had a review theory session, where more and more information about racing on a track was disclosed. Together with a drier track, a rising level of feeling secure about my abilities and the bike, this caused each session to be faster and faster, and also more and more fun! By the time Dirk and I had reached the fourth session we felt super comfortable about the track, and already completely satisfied about the day, long before it had ended! We did however suffer from loss of concentration every now and then, as most of us hadn't slept much the night before. But luckily nothing some energy drink couldn't fix (at least for me). The fourth session was especially fun for Dirk and me, as we had arranged to be driving closely together, in stead of driving separately in sub groups as had happened the three sessions before. The instructor had introduced a rotating system where every pair of drivers at some point during the session would be directly behind the marshall. After a full round, the front two would drop to the end of the line, allowing the next in line to follow the marshall and learn from him as best as he could. By the time it was Dirk and my time to follow the marshall, we tried to follow him as well as we could. Since they drive roughly as fast as the front two can handle, we created a gap in our little subgroup! After finishing our round, there was no group to wait for anymore. The entire length of the straight alongside the pit lane was empty, and we had to wait at least 15 seconds for the rest to catch up! Dirk and I felt quite proud about that (next time we'll be enlisting in a slightly faster group, group 1+ in stead of 1). The fifth session was like the others, fast and fun. However, I was able to record the session using a HD camera, borrowed from Dennis! The raw 600MB file is here. Click each photo for a larger version. What are wooden tables made of?